Born Ballywatt, Portrush 19 June 1886 to James Edmundson (d. 1902) and Mary Dunlop. Edmundson won the Irish Professional Championship (“IPC”) when he was twenty-one years of age and the following year won it again together with being placed joint eleventh in the Open Championship. 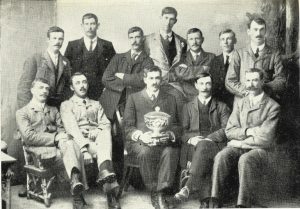 Professional competitions were normally played in conjunction with the Irish Amateur Open championship from 1895 until the turn of the century and from that time the events were organised sporadically until the professionals approached the then president of the GUI in 1906 with a view to organising an annual event. The then President, Justice Barton happily obliged and put up a golf medal for the winner of the championship, the following year the Irish Professional championship was instituted. There was a three way tie for the eight qualifying places and the final slot was decided over nine holes in the afternoon with McNeill (37), Kidd (38) and Robertson (retired). Pope beat Hood 3 and 2; Edmundson beat Hamill 5 and 4, Moran beat McNeill 3 and 2,and Snowball beat MacNamara by two holes. The following day the semi-finals saw Edmundson face Pope and Moran and Snowball would make up the other semi-final match. Edmundson took a commanding lead in the first match and was four up by the turn closing the match out on the thirteenth after a win, lose, win, and win sequence for the inward holes. The second semi-final was more exciting with the match taken all the way to the last. By the turn Snowball who was playing the better golf was 4up but in a remarkable turnaround Moran had brought the match back to level terms by the thirteenth but on the seventeenth he was laid a dead stymie and this ultimately proved to be the match winner. The final was another exciting match with neither player giving the other a quarter. Edmundson won the first, squared the second, lost the third and halved the fourth an infringement on the fifth by Snowball after ending on the road saw this hole handed to Edmundson but Snowball recovered this on the next. The to and fro nature of the match continued with Edmundson winning the eighth with Snowball responding on the ninth to square the match again. Edmundson took the next three to go three up and Snowball taking the thirteenth to reduce the deficit. The next two were halved, followed by another win by Snowball but Edmundson closed the match out on the seventeenth by 2 and 1 to become the first Irish Professional Champion. Edmundson won the championship when he was twenty-one years of age and the following year won it again together with being placed joint eleventh in the Open championship. Prior to the inaugural professional championship and Open strokeplay competition was held on the 17 May 2007 over the two courses at Portrush with a total prize money of fifty pounds. Michael Moran took the top prize of ten pounds beating is nearest pursuer, Bertie Snowball, by four shots. In the field which was predominantly Irish and to a lesser extent Scottish, the latter being there for the international event which followed, were Ben Sayers and Archie Simpson who by now were well past there prime when in the 1880 and early 90s could have been considered realistic challengers for the Open championship. The Irish were successful if lifting the inaugural Irish vs Scottish international by 13 to 4 on the 18 May 2007.
in 1907 prior to the inaugural Irish Professional Championship. On the 13th May 1908 the second Irish Professional Golf Championship took place at Portmarnock and was open to all professionals who had resided in Ireland for at least six months prior to the Championship. There was a thirty-six-hole qualifier, eighteen more than the previous year’s championship, to determine the top eight players to move to the matchplay stages. Edmundson as reigning champion was considered the favourite with Snowball and Toogood considered is most likely challengers. James Edmundson (Portrush) led the field with H. Hamill (Ormeau) both taking 160 strokes. The other qualifiers were A.H. Toogod (Tramore), Fred Smith (Royal Dublin), Bertie Snowball (Portmarnock), Hugh McNeill (Portstewart), M. Cahill (Skerries) and Tom Hood (Royal Dublin). Before a large crowd James Edmundson beat Bertie Snowball in the final by 5 and 3. While Bertie had the longer drive, Edmundson was much more competent around the green, this despite the fact that Snowball, who hails from England originally, was now playing on his home links. Any question that last year’s final favoured local knowledge was put to rest in this thirty-six-hole final. By the ninth of the morning round Edmundson was 3up after holing a mashie shot from forty yards for a three while Snowball who was bunkered off the tee just missed halving the hole with his cleek shot. The second nine was a tale of missed putts and unlucky breaks for Snowball, despite this, the match broke for lunch with Snowball four down. Although Edmundson won the first hole in the afternoon to go five up some good play from Snowball saw him reduce the deficit to two by the eighth. Edmundson won the ninth when he sunk a long putt to increase his lead the three. They shared the first two holes for home and won alternately the next two before Edmundson finally sealed the match by winning fourteen and fifteen for a 5 and 3 victory. Again James Edmundson took the golf medal and the £10 first prize. Edmundson didn’t repeat the feat in the 1909 Professional Championship but this was blamed upon his suffering a serious illness just prior to the championship and while he played the eventual winner was Moran, the first of five consecutive wins. He left Portrush in 1909 to take up an engagement as professional in Bangor later he moved to Bromborough golf club near Liverpool in 1911/1912 where he stayed until 1920. Following this he emigrated to the US and was a professional and the North Hills C.C. between 1921-1930 and won the Pennslyvania Open championship in 1923 (27 June) at the Huntingdon Valley C.C. In 1925 and 1927 he tied for the East Falls Open only to be beaten both times in the playoff. Michael Moran led after the first two rounds by three strokes with James Edmundson his nearest challenger. The O’Hare brothers were in the field with Peter (Milltown, Co. Cork) getting the better of his brother Patrick who was playing out of Rushbrooke. Moran won on a score of 310 (78,81,78,73) from James Edmundson with Patrick finishing with a 75 and leapfrogged his brother into fourth place just after Hughie McNeill. Both Edmundson and McNeill recorded course record 75s (previously) in the third round but it was short-lived as Moran’s 73 took another sizeable chip of the previous course record. 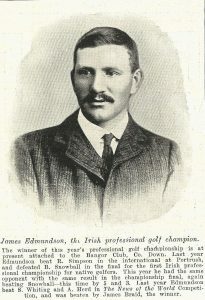 James Edmundson was not engaged by a club when the IPC was being played but was based at Portrush. In the professional vs amateur event which followed the IPC, Moran beat Munn by 4 and 3. Sunday is a dies non at Portrush so players had to make alternative arrangements to entertain themselves, most of who were based in the Northern Counties hotel. In June 1911 golfers met at the Northern Counties hotel in Portrush and hatched the formation of the Irish Professional Golfers Association (IPGA) to look after its members interests and draw up a constitutional framework. In 1912, at the £400 PGA tournament at Sunningdale Alex Herd beat James Edmundson on the 20th hole but it appears that Edmundson should have won it on the eighteenth and only lost on the 20th when he knocked Herd’s ball in while trying to negotiate a stymie. Edmundson continued to show good form in the other prestigious event in the Irish professional calendar – The News of the World – Irish Sectionals of the Professional Golfers Association which allowed the top player to compete in the matchplay stages in England for one of the top prizes in golf at the time. In 1910 Edmundson beat Moran by two strokes to take the top position at Bangor GC it was two years since Edmundson had achieved such a victory over Moran. In the same event in 1911 at the Castlerock Golf Club Edmundson was part of a three-way group tied at the end of the thirty-six holes the other being Moran and Charles W. Pope. The golfing correspondent noted it was a shame that such a find player as Edmundson should be without a club. In 1912 he again represented Ireland together with Moran at Sunningale and it was here Edmundson’s reputation was given a tremendous boost by taking Sandy Herd to the twentieth hole. The 1908 Open Championship at Prestwick proved to be his best showing in that Major but still finished in joint eleventh place nineteen strokes behind the eventual runaway winner James Braid whose nearest challenger was eight shots further back. Edmundson shot a 72 in the second round which was only bettered by Ted Ray on the day. In the 1908 championship at Hoylake he trailed Arnaud Massy by twenty-five strokes. In 1912 Edmundson entered but failed to qualify (sixty-two qualified) by a single stroke at this stage he was enagaged by Bromborough Golf Club. Appointed professional at Portrush in 1905 leaving in 1908/9 to take up an engagement as professional in Bangor Golf Club but may also have had some connection with Malone prior to this. According to the 1911 census he resided at 19 May Avenue, Bangor, County Down and was Church of Ireland. By 1911 he was unattached but later moved to Bromborough Golf Club near Liverpool in 1911/1912. When he returned after the war Bromborough hadn’t held his position as he ended up taking a job away from golf, but was not very happy. He married Clara Price in (July?) 1917. In 1920 they had their first child Jack P. while still in England. As the professional at Bromborough he instructed Gladys Ravenscroft who won the British ladies championship in 1912 and the United States Women’s Amateur Championship in 1913. Edmundson served in the artillery division of the British army seeing action in France for two years during World War. According to his grandson Jack Edmundson his brother John, who was living in the US told him there were plenty of golf pro jobs in the US (There was apparently an explosion of popularity for the game in the US after WWI.) John advised him that “all you need to get such a job is to speak with a British/Irish/Scottish accent”. His grandfather was convinced and set off for America. 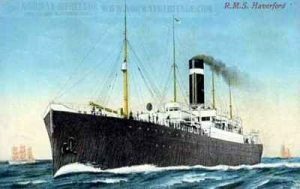 Following this he emigrated in 1921 arriving into Philadelphia on 3 March 1921 aboard the ‘Haverford’, a White Star Liner at the time, (Clara and Jack followed in 1922 aboard the Pittsburgh which docked in Philadelphia) to the US and was a professional at the North Hills Country Club, about fifteen miles outside Philadelphia between 1921-1930 and won the Pennslyvania Open Championship in 1923 (27 June) at the Huntingdon Valley C.C. Edmundson quickly made his presence felt in the 1921 Philadelphia Open at Oak Ridge when he was in the top five at the half-way mark, as was his brother John, but both faded badly in the final two rounds recording a joint tenth and fourteenth respectively. James Edmundson died 25 Aug 1950 while resided in Drexel Hill, Delaware, Pennsylvania, United States. His son Jack lived in Aldan for sixty years and was mayor for seventeen of those and there is a park named after him there.